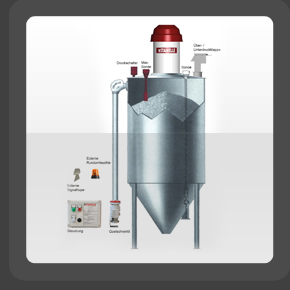 The Stanelle silo overfill protection is a self contained system. Ready to install in conjunction with the provided pinch valve, max sensor and end surge limiter this controller prevents the silo from overfilling and the silo's interior pressure from exceeding the max value. In addition the controller can also integrate the dedusting filter installed on the silo.